Hello and welcome to my new blog! My name's Michele, though some of you may know me as Rapunzel who was in pursuit of her inner pin-up. This past year has brought a lot of change into my life and I no longer feel like a princess nor a pin-up, thought it was time for a fresh start. As Monday is my 48th birthday, it seemed like the perfect time to launch! As I wrote, the past year has been full of change. 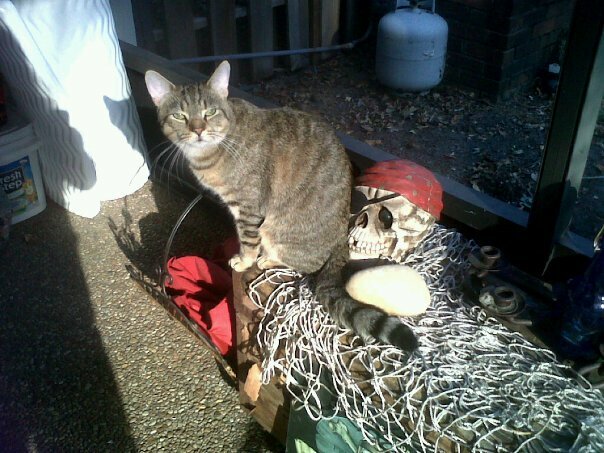 Two of my children went away to college, leaving me with an empty nest. 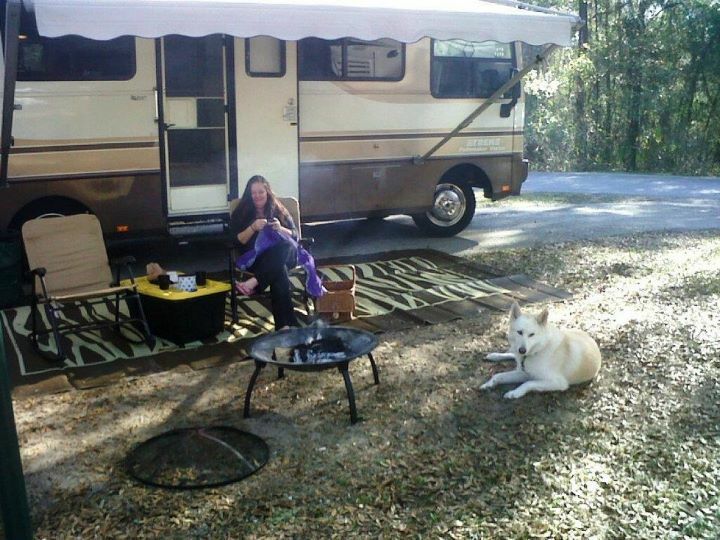 My sweetie took on a new job position which required a bit of travel, so we bought a motor home, I left my job and decided to tag along! ...so my wonderful eldest daughter, Kristyn moved back home with her boyfriend and her pets, taking care of our home and our critters when we're away. You'll meet them and my grand-critters later, I promise! 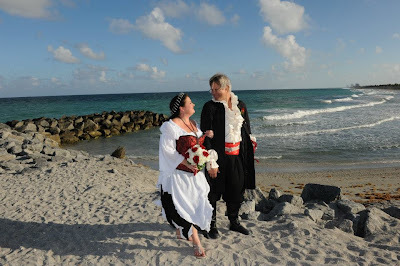 With all of the logistics in place, this past February 29th I married the love of my life in a beautiful handfasting ceremony on the beach, both of us dressed in our favorite Renaissance/Pirate attire! Yes, this is a passion of ours, I'll share more about that later. Last but certainly not least, on March 19th I decided to take the 30-Day Vegan Pledge. I'd been a vegetarian on & off for the past 25 years but wanted to take that extra step. At the end of the 30 days I was surprised at how easy going vegan was, decided that I wanted to continue on, making this a permanent way of eating, of living. I'm not a perfect vegan by any means. There are times when I accidentally eat something with dairy. I still have leather in my home and in my closet. Some of my personal products are not (yet) cruelty-free. But I'm making more conscious decisions now, researching, reading cookbooks and food labels, learning and growing. I want to live a more compassionate life, one which no creature dies for my belly or my taste buds. There are so many wonderful vegetables, grains & fruits out there, so many tasty vegan alternatives, there's absolutely no reason to go back to eating meat! 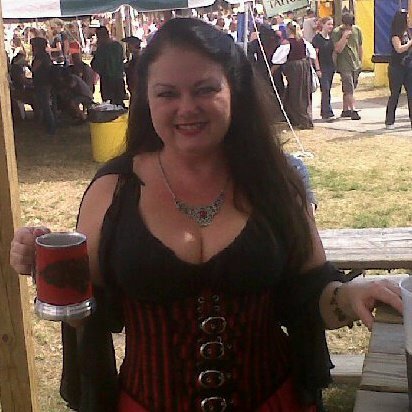 If you've read my other blogs, you'll know that I've struggled with my weight for years. I've been up, I've been down, from a size 4 to my current 12/14. I've tried Weight Watchers (a zillion time), South Beach, low-carb, Jenny Craig, etc. etc. with a certain level of success, only to gain the weight back again. I believe now that the reason these diets didn't "stick" is because I wasn't eating consciously. What I was putting into my mouth wasn't in tune with my heart & mind. Pre-packaged chemical laden meat dishes helped me lose 20 pounds, but at what cost? Counting carbs/calories/POINTS will assist you in losing weight, but it can also make you absolutely crazy! Most of those diets insisted that you consume some amount of meat/dairy in order to be "healthy," so I would shove it down and try not to think about what I was eating. If the calorie/POINT count was low, allowing me to shove more food into my face each day, I ate it. It didn't matter if the ingredients list was a mile long, if the items were impossible to pronounce much less identify! Of course, I've always loved vegetables & fruit so I made sure I gobbled up my share of the "good stuff" as well, but eating a fresh salad topped with "light" artificially flavored dressing reversed the health benefits a bit, don't you think? Anyway, since becoming vegan I have eliminated tons & tons of fake stuff from my diet. This goes for faux meat as well. About once a week I'll have a Boca or Garden burger, usually when dining out and that's my best veg option. (I realize, by the way, that some of these items do contain dairy and, again, I just have to do my very best in the situation I'm in). Otherwise, I eat vegetables and fruit. Tons of it. I've recently discovered juicing, and that has brought a whole new exciting option to my diet! I also eat grains, mostly brown rice and whole wheat pasta/bread, but I don't make them the focus of my meal anymore. Another thing I'm not focusing on right now: the scale. I do weigh myself every couple of days just to see where I stand, and yes, I would still like to lose a substantial amount of weight. But I'm not obsessing over it. You see, I'd rather be a vibrant, healthy size 12 who enjoys LIFE than an unhappy size 6 forced to eat out of boxes or count calories for the rest of her days. I love a glass of wine in the evening, an occasional piece of dark chocolate as a treat, a big bowl of whole wheat pasta topped with fresh tomato sauce and a sprinkling of red pepper flakes. I don't want to deny/deprive myself, being angry and resentful because I can't eat the things I enjoy, can't fully participate in family celebrations because the luscious (vegan) birthday cake is off limits to me. Life truly is too short! I want to spend the time I have left on this earth eating a bounty of fresh, beautiful gifts from the earth, lovingly prepared in my kitchen or someone else's. So, that's who I am, and where I am right now. At the moment as I type this, I'm sitting in our RV in the middle of a campground in central Florida. The rain is tapping on the roof and dripping from the trees, my dog is napping on the couch and I'm sipping a chilled glass of chardonnay while I wait for my hubby to return home from work. We're going out to dinner tonight, a seafood restaurant which does not have any vegetarian entrees on the menu. How am I going to eat there, you might ask? Well, stay tuned and I'll tell you! P.S. This blog is obviously still under construction, am waiting for my talented artist daughter to "bling" it up for me! Ironically, I was talking to Sue this weekend b/c I remember I liked your old blog, and now I will enjoy this one :) I would love to add it to my list of blogs I follow if that's okay. And I am always looking for vegetarian options. Would love if you can recommend ONE tofu recipe that I might like! Cheers and happy birthday! Donna, thank you so much! Hoping to see an update on yours soon, can't imagine doing a Bootcamp at any age..groan..
Mari, thank you! I just started following yours as well. Ooh, I will look at my tofu recipes and find one especially for you, perhaps something with an Italian flair? Thank you, Mary! You know how envious I am of your vegetable garden, wish we were neighbors! Thanks Michele! Just any tofu recipe that will help me LIKE tofu. Maybe one where it is crispy - I think it's the texture that turns me off. Ironically, it was a secret ingredient in the Chopped Grill Masters competition. Thank you! I have a goal to get a little camera and start blogging again. For some reason, without photos I just can't think of what to write about! lol. I will keep up with you here until I get motivated again. I am living on a little organic farm with my significant other... gardening, canning and enjoying nature to the fullest extent. I should have LOTS to blog about!